Bison left side hitter Adam DeJonckheere goes for a kill against the Mount Royal Cougars at Investors Group Athletic Centre. Adam DeJonckheere walked off a U SPORTS volleyball court for the last time of his university career in Vancouver Feb. 24. 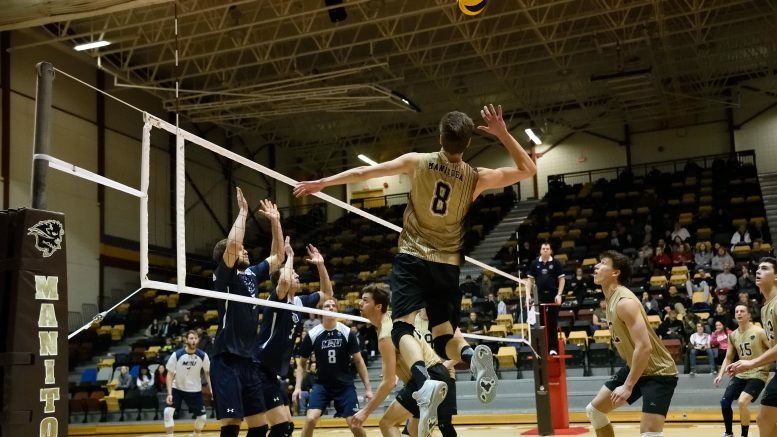 Left in his wake are new records, many memories, and a permanent stamp on the University of Manitoba men’s volleyball program. DeJonckheere finished his career second in all time Canada West conference kills with 1,394. The left-side hitter also finished second in career conference points with 1,596.5. DeJonckheere finished 20th all time in career conference digs with 629. He was named to the Canada West All-Rookie team in 2013-14, and was a Canada West Second Team All Star this past season. “When I’m five, 10 years removed I can look back and see that I’m a part of a history that’s going to be something I can be proud of for the rest of my life,” the 22-year-old said. Being proud of a history was something DeJonckheere got to do every time he and his teammates walked into Investors Group Athletic Centre for practice. Manitoba has the most Canadian university national championships of any volleyball program, and the evidence is hanging amongst the rafters. “We train in this gym every day and look up and see all the banners we just try build on that legacy,” he said. It was a gym he entered during his Grade 11 year with the St. Paul’s Crusaders for volleyball provincial playoffs. DeJonckheere did in fact play at IGAC again – in a Bison uniform, although it very well could have been in the red and black of the University of Winnipeg Wesmen. The Wesmen were the only team to recruit DeJonckheere out of high school. DeJonckheere wasn’t a big fan of the academics at the U of W, and contacted Bison head coach Garth Pischke. Pischke said he had seen DeJonckheere play at a tournament held at the U of M and eventually offered him a spot in a red-shirt capacity. During the 2013-14 season, Pischke was on a sabbatical, leaving current vice-principal at Collège Jeanne-Sauvé Cameron Johnson in charge to give DeJonckheere a chance. DeJonckheere remembers the first time he stepped on the court as a Bison and the absolute excitement he felt. Even now as a wily old veteran he said the feeling never left him. Having now spent so much time as a Bison, DeJonckheere said that to be a Bison is to be homegrown. The vast majority of Bison volleyball team players come from Manitoba. “We have such a local connection with our team, we don’t really import players at all,” he said. Last season, a group of Manitoba boys dominated the Canada West, finishing first with a 21-3 record and hosted the Canada West Final Four. Manitoba eventually went on to place fifth at the U SPORTS National Championships at the University of Alberta in Edmonton. “That was such a special group we built essentially four solid years leading up to that point and just being able to accomplish the long-term goal we had set was really rewarding even if we didn’t medal,” DeJonckheere said. Two years prior to Manitoba’s national appearance was a low for DeJonckheere. The Bisons needed one win to secure a berth at nationals at the Canada West Final Four in Edmonton and they fell short, failing to win a single set. “We came up flat against Saskatchewan and Alberta and that was definitely a low point because we had such high hopes for ourselves,” DeJonckheere said. Looking into the future, DeJonckheere is still unsure what next year will bring. He has had contact with some agents to go play professionally but that is not something he is too keen on, yet.